It's official: The legal fight over the constitutionality of President Obama's health care overhaul will be decided by the Supreme Court, which said today it will hear oral arguments by March, and will issue a ruling in late June. What's at the heart of the legal dispute? The Affordable Care Act (ACA), passed by Congress in March 2010, requires that almost all Americans buy health insurance--a provision known as the "individual mandate." The mandate was originally a conservative idea, but many on the right now argue that it violates the Constitution's Commerce Clause, which limits Congress' authority to issues that affect interstate commerce. The choice to buy insurance is a personal matter that doesn't fall under the Commerce Clause's provisions, the law's opponents say. The Obama administration counters that when people without health insurance get sick, they're treated in the emergency room, often at taxpayer expense. So the decision to go without insurance, they say, does indeed affect interstate commerce. The law's defenders also point out that courts have defined interstate commerce very broadly in the past. For instance, the Supreme Court ruled in 2005 that the federal government may criminalize the use of home-grown marijuana for medicinal purposes, because doing so helps it regulate the interstate marijuana trade. Numerous lawsuits have been filed against the law, by a range of conservative advocacy groups and public officials. In total, three courts have struck down the law or the individual mandate provision, while six courts have upheld the law, according to a tally kept by the Kaiser Family Foundation. (Several other cases have been dismissed on procedural grounds.) The competing verdicts made it all but inevitable that the Supreme Court would step in to resolve the issue. The specific lawsuit that the high court will consider is one filed last year by the state of Florida, and joined by 25 other state attorneys general, among others. In January, District Court Judge Roger Vinson, who was appointed by President Ronald Reagan, ruled that the individual mandate violates the Commerce Clause, and struck down the entire law. When the Obama administration appealed, a federal appeals court in Atlanta agreed with Judge Vinson that the mandate is unconstitutional. But the appellate court also ruled that the law is "severable," meaning that its other provisions--such as regulations governing the health insurance industry, and state-based exchanges designed to make insurance more affordable, for instance--can stay in effect. The Supreme Court will therefore be deciding two major issues: Is the individual mandate constitutional? And if not, must the rest of the law be struck down with it? How is the Supreme Court likely to rule? It's very hard to say. When the lawsuits were first filed last year, most experts--noting that the court has generally taken a broad view of the Commerce Clause--gave them little chance of success. But as several lower courts have ruled against the law over the last year, that view has begun to shift, with analysts increasingly saying it's possible the Supremes could overturn the Affordable Care Act. More recently, though, the momentum may have shifted again. By and large, judges appointed by Democratic presidents have upheld the law, and those appointed by Republicans have overturned it. But last week, an appeals court upheld the law, with the strongly worded opinion written by Judge Laurence Silberman, a conservative appeals court judge appointed by President Reagan. That had some experts predicting an eventual triumph for the administration. 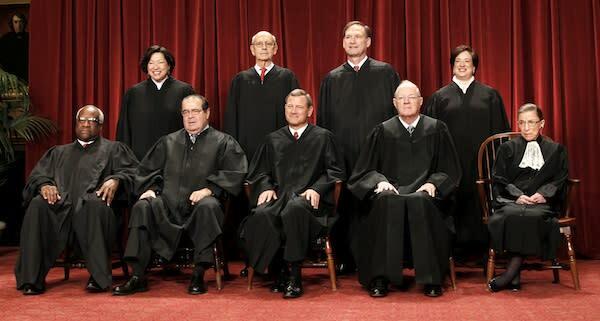 The court currently contains five justices appointed by Republicans and four by Democrats. But one of the GOP-appointed justices, Anthony Kennedy, has voted with the liberal wing relatively frequently. States have begun the process of setting up the exchanges that are the law's prime mechanism for making health care more affordable. But most of the law doesn't go into effect until 2014. As a result, there's also a legal question over whether the law can be challenged before it's been fully implemented, or whether the suits should have to be put on hold until 2014. The Supreme Court has said it will resolve that issue, too. We have to ask: What about the politics here? President Obama campaigned on fixing the health care system, and whatever you think of it, getting ACA passed was the biggest domestic achievement of his presidency so far. But perversely, a ruling striking down the law might well give his re-election prospects a boost, by energizing his liberal supporters. By contrast, a ruling that upheld the law could be a boon to his GOP challenger, by enraging conservatives and making them more likely to come out to the polls in November. All of the leading Republican presidential candidates have said they'd seek to overturn the law if elected.